David Risley Gallery is proud to present the American artist Charlie Robert’s third solo show at the gallery - JUICY XXL. 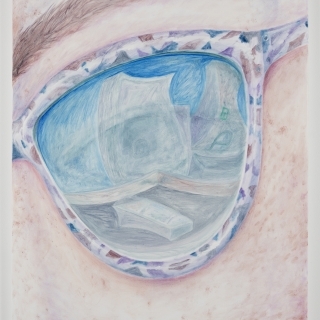 The exhibition presents new drawings and gouache on canvas. From the 14th to 18th of October the gallery will participate at SUNDAY Art Fair in London with a solo project by Charlie Roberts with new modified rugs, ceramic pots and figures that sample everything from faces to leaves, fishes and abstract forms all in pastel colours. Few artists have the courage to freestyle in front of a canvas. Roberts makes works with a deceptive effortlessness. He is fearless and polymath in his approach to subject, style and technique. The result becomes full of energy, determination and a unique expression, when he makes his recognisable female figures with soft curves in bright colours on a pattern or monochrome background. A primitive brutality assimilates with a tight line that draws the women’s contour and creates a seductive and distorted realism. Charlie Roberts is fascinated by hip hop culture’s parallel universe and its ability to create an illusion of a great lifestyle with expensive cars and gorgeous women all in a very cheeky attitude. The title JUICY refers to the American rapper The Notorious B.I.G.’s first single about a rapper’s rise to the top. While XXL not only indicates the size of the show but also refers to the American hip-hop magazine XXL established in 1997. The illusion of the good life goes on in the paintings, where beautiful young sporty women work out with a smile while sweat trickles down them, play tennis with the racket, arms and legs sinuously morphing and entwining around each other. Another girl skates with a gigantic ghetto-blaster. Charlie Roberts find his inspiration in everyday life, hip-hop culture and at the same time leads your thoughts to Matisse’s dancers. Please join us for the opening on Friday October 2nd from 17.00 with hip-hop DJ’s in collaboration with the fashion brand SOULLAND. In collaboration with Charlie Roberts they have designed their S/S collection 2016. Charlie Roberts b. 1983 in Kansas, USA. He lives and works in Oslo, Norway, New York and Los Angeles, USA. Roberts is educated at Emily Carr Institute of Art and Design, Vancover, Canada and Kansas University, USA. Charlie Roberts has exhibited at Richard Heller Gallery, Los Angeles. Trafo Kunsthall, Oslo. Galleri Magnus Karlsson, Stockholm. Kunsthal KAdE, Amsterfoort, Holland.